Home > Used Vehicles > 2018 BMW X1 SPORTS ACTIVITY PKG,SUNROOF,2.8,BACK UP CAMERA,POWER LIFTGATE, MUCH MORE!!! 2018 BMW X1 SPORTS ACTIVITY PKG,SUNROOF,2.8,BACK UP CAMERA,POWER LIFTGATE, MUCH MORE!!! Cylinders: 2.0L I4 16V GDI DOHC Turbo - 4 cyl. Local, Trade-in, Leather Seats, Heated Seats, Rear View Camera, Remote Keyless Entry, Aluminum Wheels! On Sale! Save $3400 on this one, we've marked it down from $41900. 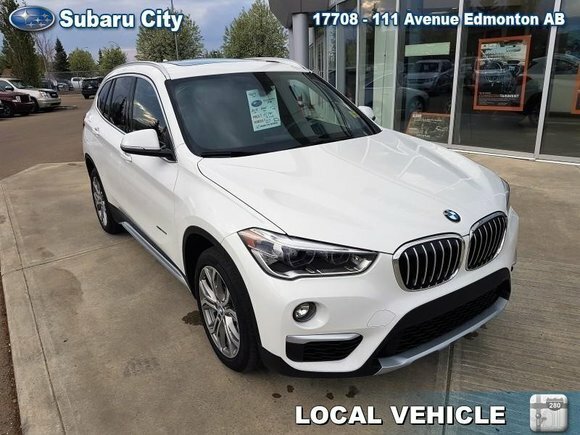 This 2018 BMW X1 is for sale today in Edmonton. The smallest within the X range, the BMW X1 is a compelling compact city Crossover offering more than you bargained for. As with any BMW, the X1 is a beautifully designed vehicle with high on road capabilities and one of the most well built quality interiors within its class. Big on space for both cargo and passengers, the compact X1 is perfectly comfortable to drive and be driven in. This SUV has 19025 kms. It's alpine white in colour. It has an automatic transmission and is powered by a 2.0L I4 16V GDI DOHC Turbo engine. This vehicle has been upgraded with the following features: Leather Seats, Heated Seats, Rear View Camera, Remote Keyless Entry, Aluminum Wheels, Air Conditioning. It has some remaining factory warranty for added peace of mind. Want to try the 2018 BMW X1 SPORTS ACTIVITY PKG?